So yeah its been awhile... but Spring has sprung once again and the garden planning is starting. Tonight was a rare occasion where everything came together into this great feast made of mostly local ingredients from around the state. 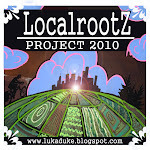 Stay updated for more detail posts as the localroots train gets back on track.